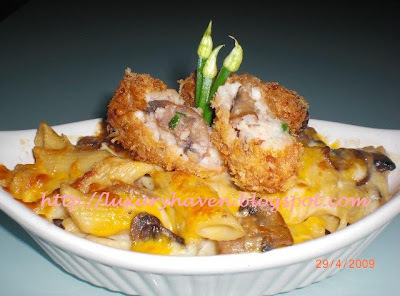 I created this dish using Lazy Gourmet’s Mushroom Alfredo Sauce to complement my Gratin main course, which was part of our Quick Fix Meal. This rich & creamy classic sauce contained generous portion of bit-sized button mushrooms, which was a great addition to the seafood ingredients. Water chestnuts were also used to add crunch to the Seafood Rolls. If possible, get the “ready-made” ones in vacuum-packed or cans if you dislike handling mud. I couldn’t find it in the supermarkets, hence the mess. 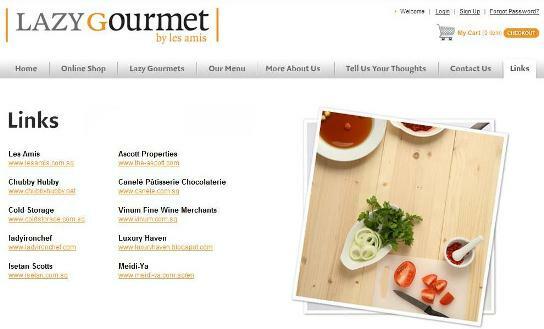 Find Luxury Haven's link @ Lazy Gourmet! Follow the reheating instructions at the back of the box & set sauce aside. Wash the chestnuts thoroughly to get rid of the mud. Remove skin & cut it up into tiny pieces. Remove the “insides” & skin from squid. Rinse thoroughly & dice it. Rinse & mince the fish. Dispose prawn shells & heads. 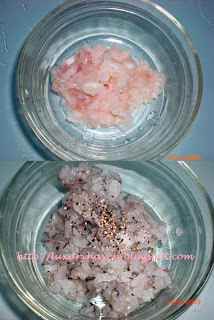 Devein, clean & minced the prawns. Sprinkle a dash of black pepper & mix well. Mix all the ingredients together. Scoop up a spoonful of mixture onto your palm & mould into your preference shape. 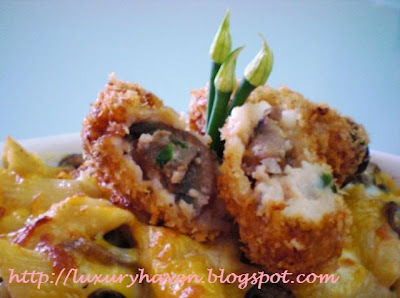 Add about 5 tbsp of breadcumbs onto plate & cover the seafood rolls with the crumbs. When oil is hot, lower the rolls gently to prevent breakage & deep-fry till golden brown. Do not over-cook or you’ll lose the rich creamy sauce in your rolls. When done, place it on top of the gratin & serve piping hot. Cook the Penne according to instructions behind packaging & drain well. Mix the Penne with the balanced sauce (remember I "stole" some earlier to make the Seafood Rolls?) & top it up with cheese. Grill it for about 5 mins or till cheese brown. Serve it with the Crispy Seafood Roll, which makes a great complement. See above for Gratin pix. 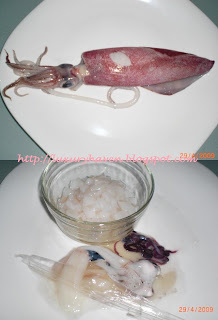 I have never eaten squid before, but this looks like a very unusual and delicious way to eat it! Good job! Rosidah, u've a great weekend too! Heavenly Housewife, u kidding me right?? Scrumptious! I would love to try! Love this version of the roll. It sounds like it'd be hard to resist. Hey Blackswan, I followed your recipe & made my mother the Seafood Roll on Mother's Day & she loved it! 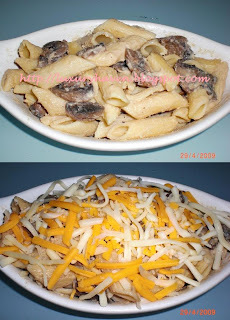 I also used the Alfredo sauce to mix with her rice & she likes the combi. Love your blog! !